There are a few different ways to get your photos and videos from the camera to your computer. We do not recommend using a USB Hub or Media Reader. 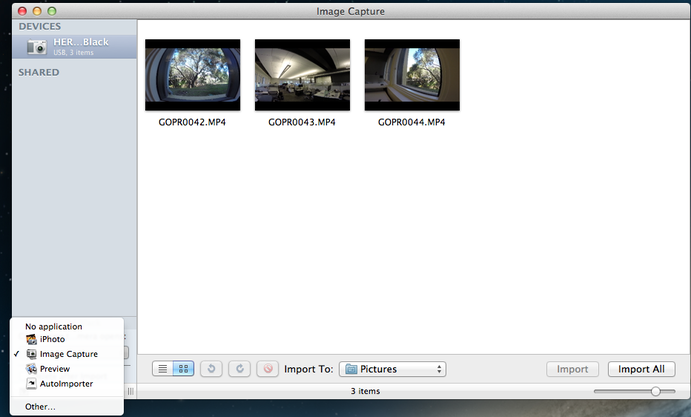 Open a new Finder window. Your SD card will be on the left sidebar under the "devices" section. Select the file(s) you want to Import and select Import, or Import All if you want to import everything. If you do not have Image Capture set up to automatically launch when you connect your camera, you can easily do it manually. Select the magnifying glass in the top-right of your desktop. Once the selected application opens, you can import your files just like in Method #2. To set up Image Capture to launch automatically when you connect your camera you must first either launch Image Capture. From there it's just a matter of selecting the desired program. In Image Capture there is a setting in the lower left called: "Connecting this camera opens:". 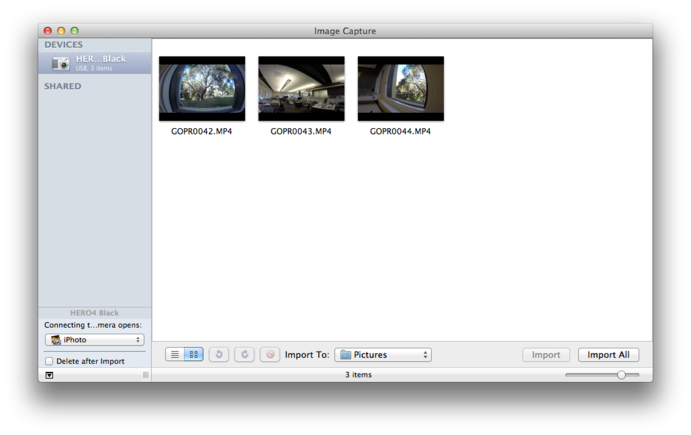 It gives you the option to select No Application, iPhoto, or Image Capture. Select Image Capture.